The 4 star Hotel Garden is located in Terni (south Umbria) in a strategic location very easy to reach. It’s built at the foot of the green hill on the north side of the San Valentino’s city, a few miles from the center. We have a big parking area for 170 cars, where you can leave your car without fear and our garage is at your disposal for you motorbike or your bike. Thanks to its convenient location, near the E-45 higway Orte-Cesena (exit Terni-ovest), the Hotel is the ideal starting point to visit Umbria and Rome, which is 62 miles away from the Hotel and the perfect location for meetings and conventions. The 4 stars hotel is run by the same family since 1980 and all those years had helped to create a warm and welcoming atmosphere. The staff is so friendly that we are sure you will suddenly feel at home! Its 93 rooms are ready to welcome you! The Hotel makes a special effort to be perfect for every guest, so that you can find the room that fits your needs whether if you are travelling for business or leasure. You can enjoy the free wi-fi connection in the rooms and in every area of the hotel to stay connected as long as you want. Breakfast is served in a bright and welcoming room with a rich buffet even with local delights to share with you Umbrian culinary tradition. You’ll find gluten free food, but the staff is at your disposal if you have any different food allergy or if you follow a vegetarian or vegan diet. The Restaurant “Il Melograno” can accommodate up to 500 people in a warm and cozy atmosphere. The menu is inspired by Umbrian tradition enriched by the chef. Gluten free and veg food is available on request. 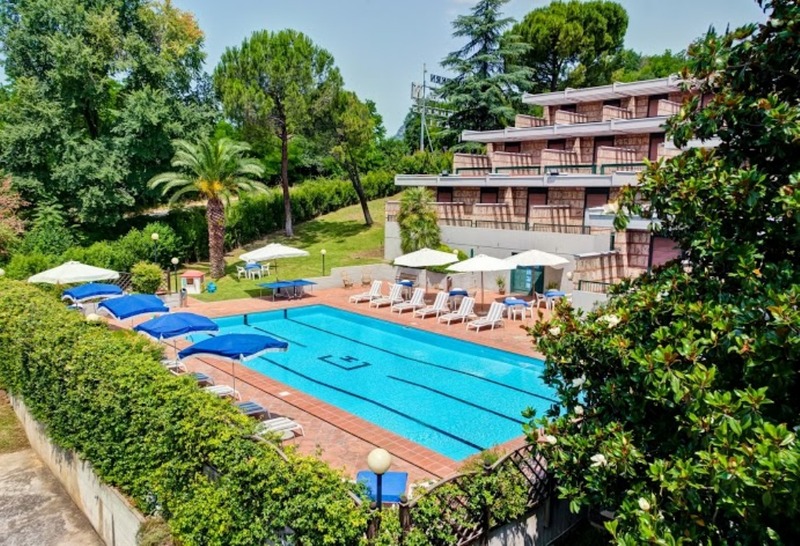 Garden Hotel is sport-friendly: the local football team, Ternana Calcio has been choosing it for a long time now to host their players and every year it welcomes many athletes for different races. But being sport-friendly means also to help the Hotel guests to be in shape! In winter time you may exercise in the free gymnasium (not on the premises) or go out for a run: the staff will be pleased to show you some different running routes. In summer time the outdoor pool will offer you a pleasant and relaxing stay surrounded by greenery. The business center is Hotel’s flagship, with many different rooms and you’ll definitely find the best for your needs. The city centre and the railway station are only 1,25 miles from the Hotel and you can reach them by car, feet, taxi or bus which stops just in front of the Hotel’s premises.